We are one of the most well-distinguished companies in the market that are into offering Aeron Office Chair. 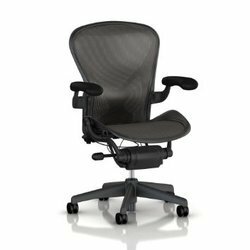 We are leading supplier of Aeron Chair. We are sole distributor of Herman Miller Office chairs for all over Gujarat. The Aeron chair didn't end up in the Museum of Modern Art's permanent collection just because it looks cool. Although it does. Its looks are only the beginning. Aeron accommodates both the sitter and the environment. It adapts naturally to virtually every body, and it's 94% recyclable. Even if it's black, it's green. We provide durable & long lasting chairs for office purposes.